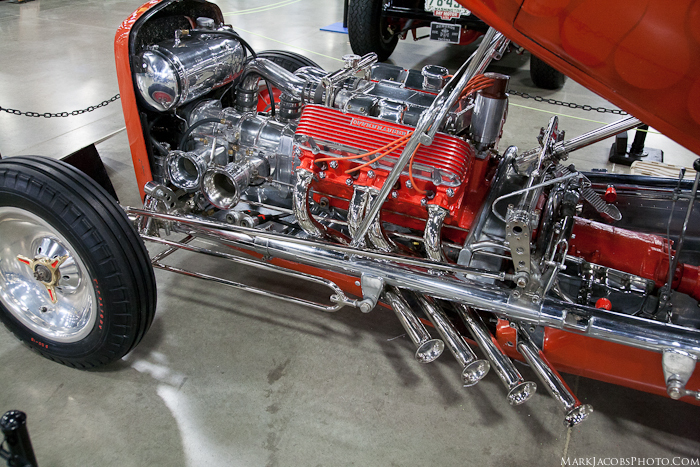 Mild to Wild Car Show , Puyallup,WA. 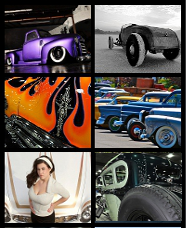 We don’t have the weather like California , so when we have a custom car show this early in the year is kinda of a bonus! 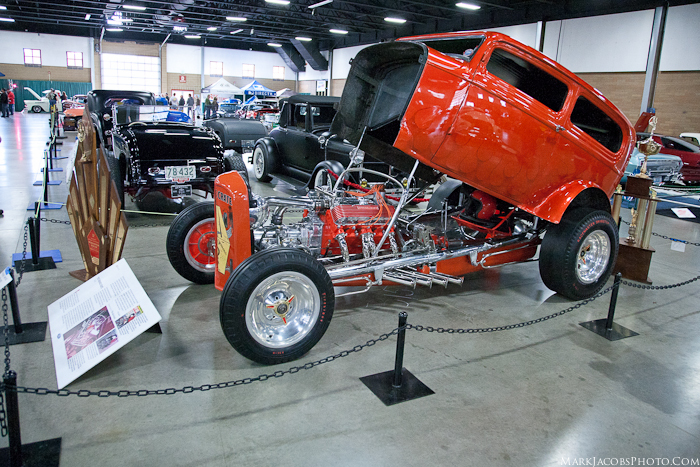 The Mild to Wild Car Show has been around for 20 years and recently return to the Puyallup Fair and Events Center after many years at the Tacoma Dome. The was actually the car show’s original starting location back in 1989. This year it was inside three of the buildings at the Fair grounds, unlike the Gooduys Show that takes over the inside and outside of the complex. 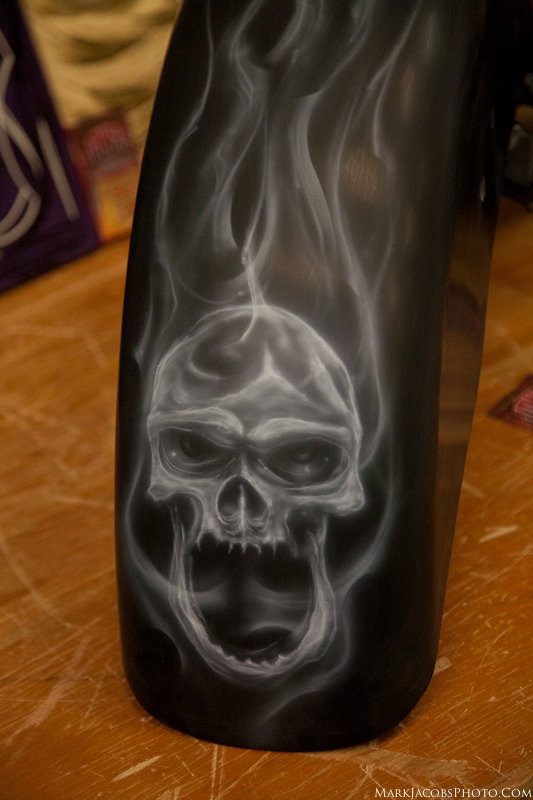 Not a real big show, but had some really cool customs from the northwest. 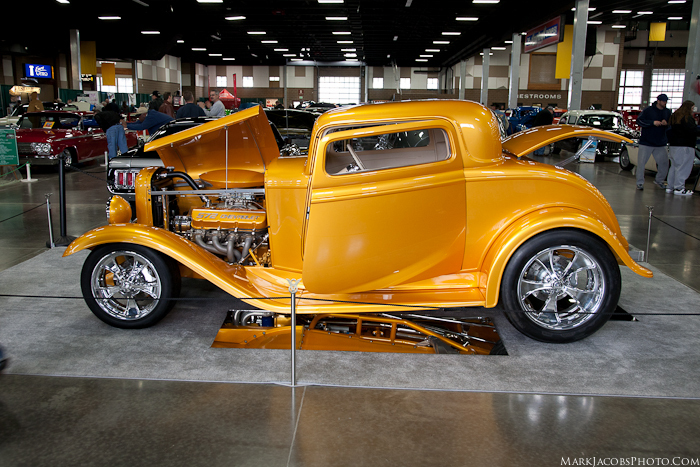 Check out this Gold 1932 Hot Rod coupe wtih a Chevrolet 572, From Ravensdale, Washington. 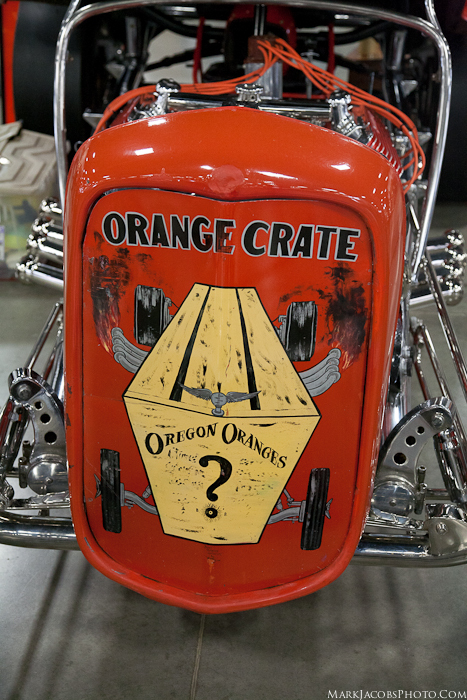 Here is some real history “The Orange Crate” 1932 Ford Sedan all steel, Built by Bob Tindle from Portland,Oregon. It made the cover of Hot Rod two times 1960 and again in 1962. In 1963 the Revell Company created a 1/25th scale model of the sedan. Which you can still buy, they released it. It would turn 10.60 in the quarter mile back in the day. It is now owned by the Gord Family. Look at this engine , just a work of art. It’s only time ,money and a lot of hard work. Now I wonder where I can get my own model kit of this car? 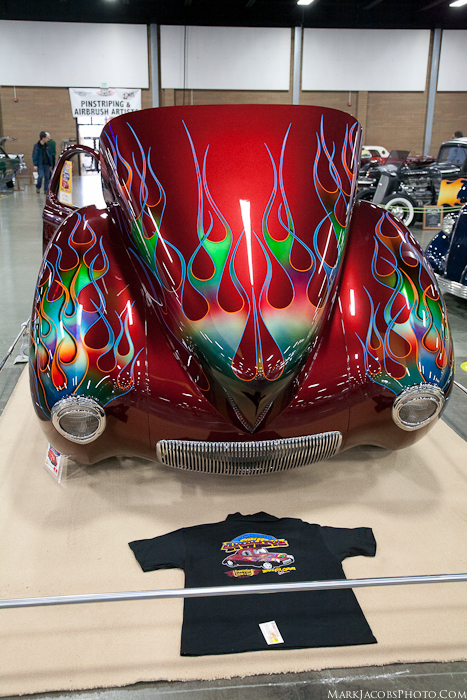 Here is a cool flame job on a 1941 Willys . 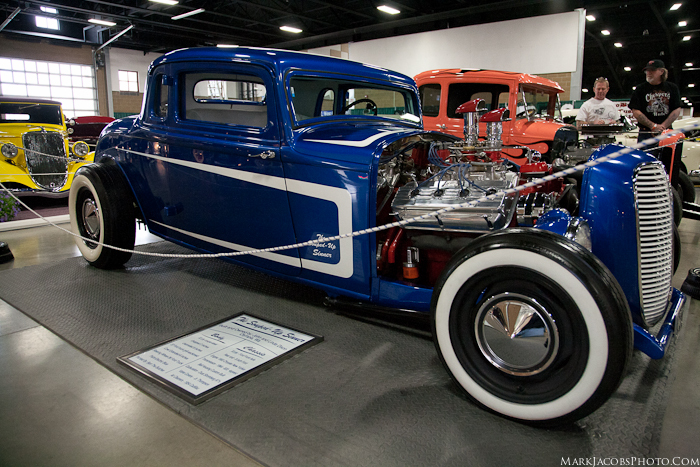 A nice vintage looking 1933 Plymouth coupe , 2 inch chopped top and channeled 6 inches. 1955 Chrysler powered, 833 4 speed with a 8 inch ford rear. Custom made 1937 Ford Truck grill to finish it off. Built and owned by John and Linda Dixon. I’m a really big fan of skulls, and I thought this was really cool. Created by Josh Jones. 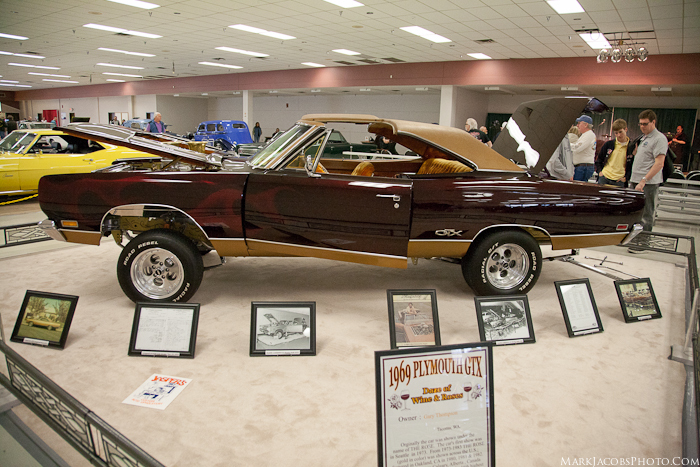 This 1969 Plymouth GTX is a real 70’s show car. “Daze of Wine and Roses” was originally shown under the name of THE ROSE. 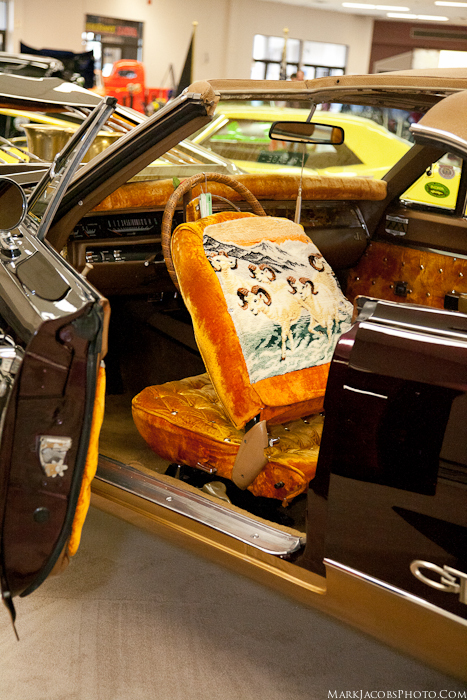 The car’s first show was in Seattle in 1973. From 1973-1983 THE ROSE (gold in color) was shown across the US and featured in Oakland in 1980,1981 and 1982. The last show was Calgary, Alberta, Canada in 1983. THE ROSE retired as the 16th highest rated car in ISCA events. 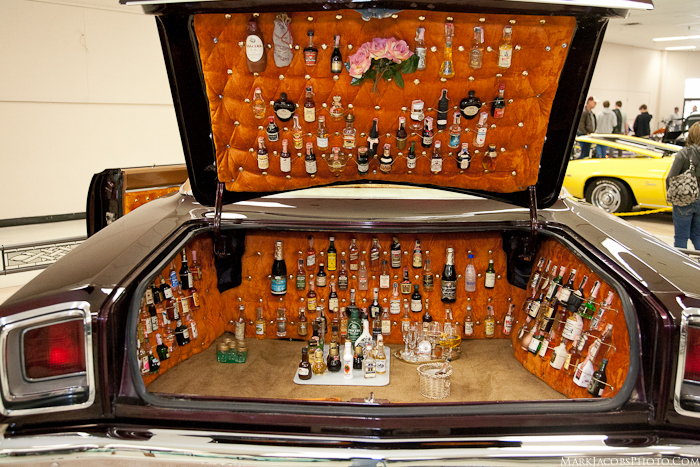 Ok… now we can have a drink.